Basil Oil Holy (India) - Ultra International B.V.Ultra International B.V.
Holy Basil, also known as Tulsi or as the botanical Ocimum tenuiflorum and Ocimum sanctum is native to parts of Southern India and South East Asia. It is used extensively across India in the practice of Ayurvedic medicine and for spiritual purposes. In Ayurvedic medicine it is know to help treat colds, headaches, stomach disorders, inflammation, heart disease, various forms of poisoning, and malaria. As a food ingredient the dried herb is very popular in Thai cuisine where it is often called 'Thai Holy Basil' (known locally as kaphrao). You will find it in many traditional Thai dishes so look out for it when you next indulge in your favourite Thai dishes! In aromatherapy Holy Basil purifies and cleanses the air and is thought to support our respiratory, nervous and digestive systems. It can also be used as an 'energiser' in room diffusers it is thought to stimulate the creative receptors in the brain when working (a good one to sneak into the office!). 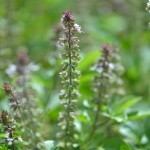 Given its typical high yields of eugenol, Holy Basil Oil may be compared as a cross between Clove and traditional Basil. Basil or Sacred Tulsi, popularly calledthe “queen of herbs”, comes from the Lamiaceae family. The harvesting season is over and material is difficult to find.